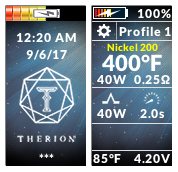 Hi all, I’m an ex-vaper now and haven’t been maintaining this theme for some time! If anybody wants to take over and update it please feel free to do so. If there’s anything you need, or if you want access to my account to post updates please let me know. You can contact me at jakejunk1@icloud.com Cheers! I believe you have to change Max Output under the Mod tab, at least that's what worked for me! This is a great theme, it's so clean and simple. Thanks for sharing! I am wondering this also This is how I do it.. After you have uploaded a new version wait for a minute or 2 then on your theme's page under 'File Actions' choose 'Edit Details', down the bottom there should be a section for 'Primary Screenshot'. Select which image you want and save. When you upload a new version I think the forum software parses your file and generates the screenshots which seems to take about 30-60 seconds, which is why I recommend you wait for a minute before clicking edit. I'm not sure if there is a better/easier way to do it but if there is I'd like to know also. In case you ever upload multiple versions, I have found that it only generates screenshots for the last uploaded file i.e. the file at the bottom of the list. So if you want the screenshots to be of a specific version you have to upload that version last. Looks very nice! Just so you know, mod internal resistance and unlock sequence are Escribe settings and not contained within themes. I get about a day out of mine, vaping anywhere between 45-75W using 2 VTC6s. I usually have another set of batteries charged and ready to go. It's difficult to tell if your batteries are draining too fast as everybody has a different style of vaping. As an example - if you were to vape solely at 40W on a fully charged pair of VTC6s I would expect you would get somewhere around 1,600 seconds total puff time. Divide this by the average time of your puffs to figure out roughly how many puffs you can expect out of a full charge. My puffs are always around the 3.5 second mark so 1600/3.5=457. Obviously if you up the wattage you will get less battery life and vice versa. Hope that helps! Thanks! I still can't see it though. I'm using the Mac beta perhaps that is why. The closest I can get is to double click an image/gauge and it will open a finder window, but it's a seemingly irrelevant window. How fast is fast? It really depends on what wattage you vape at, how often you vape, and how healthy your batteries are. Same functionality as my other themes. Loads of colour! US version: Date format m.d.yy and spelling e.g. atomizer UK/AU version: Date format d.m.yy and spelling e.g. 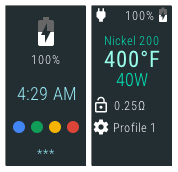 atomiser Features / how to use: -Large battery bar on lock screen for quick viewing. -Dynamic status bar on Lock Screen, Main Screen, Settings Menu, Lock Settings and Device Monitor Settings. -Lock Screen shows asterisks (**) as you enter your unlock sequence. -Settings Menu shows the name of the highlighted icon. (Atomiser, Display, Puff Info etc.) etc. etc... Please note that you won't actually see 'DNA' on the screen, only relevant text. -Temperature, resistance lock and preheat options will only display when a temperature sensing material is selected. i.e. in plain wattage mode the options for these will disappear. -Selecting the coil material on the Main Screen takes you directly to atomiser settings. Note that coil material is not displayed if you are in wattage mode. -Most screens feature a 'Back' or 'Exit' button or a combination of both. 'Back' will take you back to the screen you came from, e.g. if you go to Atomiser Settings from the Settings Menu the back button will take you back to the Settings Menu. If you go to Atomiser Settings by selecting the coil material on the Main Screen, the Back button will take you back to the Main Screen. In all cases the Exit button will take you directly to the Main Screen. 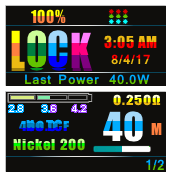 -Black background on the Device Monitor, Diagnostic and Device Info screens to make the text easier to see and read. 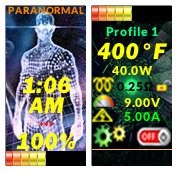 -You can alter 'Watts:' and 'Temp:' on the Diagnostic screen. -Screens you can fire from: Main Screen (obviously), Atomiser Settings, Device Monitor and Diagnostic. Pressing the fire button on any other screen will give the same result as selecting 'Back'. e.g. if you are on the Display Settings screen you can press the fire button twice to go back to the Main Screen- pressing once goes back to the Settings Menu and another press takes you back to the Main Screen. -Select the graph on the Device Monitor page to access the Device Monitor Settings. -Board temperature and battery voltage are displayed at the bottom of the Main Screen. -Time & Date and Lock Settings are accessible from the System Settings screen. -The 'Display' icon on the Settings Menu changes based on whether stealth mode is enabled or disabled. -The options for stealth level are 'Off', '1', '2', or '3'. 3 = Screen turns off 2 = Very dim 1 = Dim Off = Stealth mode is disabled -Indicator light: Fade in/out red = charging Green = charge complete Blue/purple = firing Enjoy!